A complete anti-aging system in 4 all-natural products! 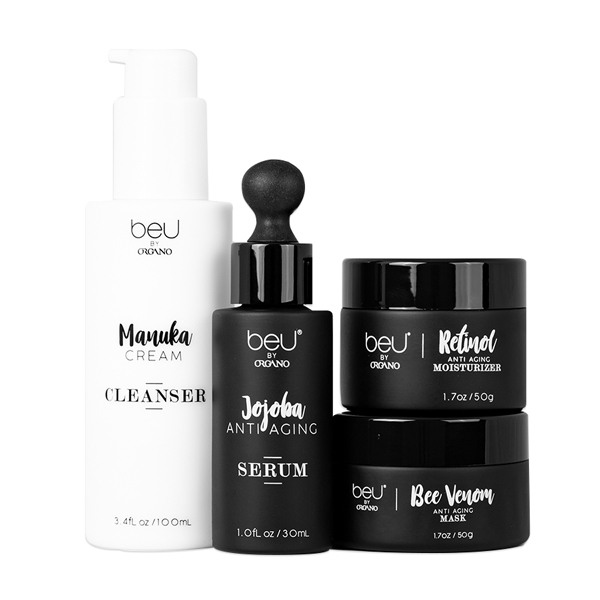 beU Manuka Cream Cleanser is a gentle concentrated cream cleanser to remove makeup and impurities. beU Jojoba Anti Aging Serum hydrates and nurtures skin to help preserve youthful glow. beU Bee Venom Anti Aging Mask helps stimulate the production of collagen and elastin in your skin and helps to minimize the appearance of fine lines and wrinkles. beU Retinol Anti Aging Moisturizer is a pH balanced cream with active ingredients and oils that works all day long to visibly help diminish the appearance of wrinkles and fine lines. beU is your 3 step skincare solution that provides you with everything you need to keep your skin young, healthy and glowing. Manuka Honey helps retain skins moisture. Honey’s natural antioxidant and antimicrobial properties help to protect the skin, while supporting the skin’s ability to rejuvenate and refresh depleted skin. Our organic Manuka Honey is harvested in the South Island of New Zealand. Jojoba Oil compared to other seed oils is unique because it is structurally and chemically very similar to the human sebum produced by the sebaceous glands in our skin. Because sebum is also largely comprised of wax mono esters, it can act as a substitute while giving similar or added benefits compared to sebum. Bee Venom is a complex combination of chemical substances produced by the worker and queen honey bees, harvested in a way that doesn’t harm the bees. Once the venom is collected, the bees return to their hives, unharmed. Vitamin A Retinyl palmitate reduces the appearance of wrinkles and fine lines with continued use. The development of fine lines and wrinkles on your face is a natural part of the aging process. These signs of aging are accelerated by lifetime exposure to ultraviolet rays, a process known as photo-aging. As you smile, laugh or frown, over time your skin also forms wrinkles.